For a moment, forget what you know about books—that they contain stories, pictures, and information. Think about their form, the rectangular block containing sheaf after delicate sheaf, flexible and tactile. In the sculpture of Asheville artist Andrew Hayes, the book block is paired with steel, the fragile folios of paper contrasting with sturdy metal elements to create organic shapes that twist and curl and surprise with their fluidity. There’s no irony or intention in the choice of the books: they range from an old encyclopedia to a classic hardcover. What matters is the shape that the block of pages takes when it is bent, folded, or fanned out. “Among the artists I know who transform books into sculpture, Andrew Hayes’ work is unique,” says Jordan Ahlers of Blue Spiral 1, the Asheville gallery that represents his work. “What strikes me is the balance he achieves between the strength of metal and the delicate nature of paper.” That balance also struck AmericanStyle magazine, which named him one of eight emerging artists to watch in 2009. Hayes developed his approach after studying sculpture in his native Arizona and working as a welder, creating three-ton beer and wine vats and car-toting trailers. Those industry jobs paid him well enough to fund classes at Penland School of Crafts, including a course that introduced him to the idea of using books in his sculpture. He returned to the Mitchell County school as a Core Fellow from 2007 to 2009, and after completing his stint, spent three years working as an assistant for Asheville artist Hoss Haley, who he credits for helping him develop creatively. Paper, explains Hayes, is used to make models for metal sculpture because it behaves in much the same way that metal does. From using paper models, it wasn’t too far of a stretch to alter an entire book. Using what’s called a guillotine cutter (a tool that acts just as it sounds like it would), he chops the spine of a tome, then fans out the pages until the block achieves a shape he likes, making additional cuts or altering the edges of the pages. Next, Hayes shapes steel with hot and cold processes to cradle the paper form in place. “It becomes a problem-solving exercise,” he explains. The pages are riveted or otherwise secured in place, so that although there is some give, the steel and paper are forever bound. 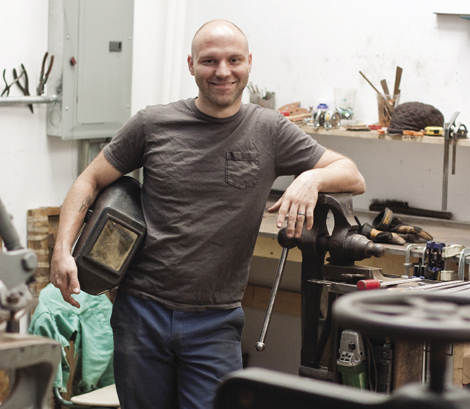 Hayes shares a River Arts District studio space with fellow metal worker Zach Noble, where along with modern tools, he uses a guillotine from the 1870s and a metalworking press from the turn of the 20th century. As printed books move slowly toward obsolescence, they’re increasingly easy to find and create a seemingly endless (and cheap) supply of material. By focusing on the beauty of the form, Hayes gives them a value that goes beyond the words on the pages.